Foraging for fungi and the resulting activity in the kitchen is often thought of as an autumn pursuit; not so. 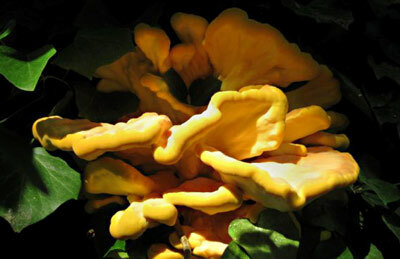 Chicken of the woods (sulphur polypore/Laetiporus sulphureus) is one of many types of fungi that appear over the summer. This particular fungus often appears in late June, rather obligingly in the same place year after year; its dead whitish fruitbodies signposting the way to next years crop. It’s impressive to behold; bright yellow brackets with peachy orange highlights, often growing in quite large groups. It grows on a lot of different trees too – broad leafs like Willow, Alder, Oak, Beech to name but a few and some conifers (particularly yew apparently!). Unfortunately the fungus eventually kills the tree it grows on, turning the heartwood to a brown mess- so not exactly a never ending supply! It is delicious though; I like to slice it thinly, fry it up with bacon and liver and have it on toast. There are many other fungi around during the summer, some edible, some distinctly not, but all fascinating. So keep your eyes open, and a field guide handy and you might be in for a culinary treat (or a really interesting photo!). 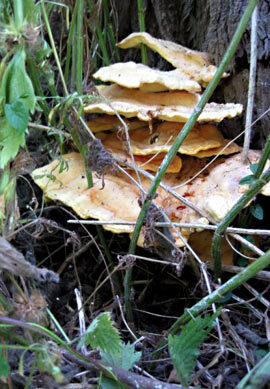 DO NOT EAT ANY FUNGUS UNLESS YOU ARE CERTAIN OF ITS IDENTIFICATION. The correct identification of fungi is covered in a number of Ray’s books – Outdoor Survival, Wild Food and more extensively in Essential Bushcraft – as well as on our Journeyman Course, where Mycologist Claudia is on hand to give in-depth advice. This entry was posted in The Woodlore Team on July 15, 2010 by Woodlore Team.